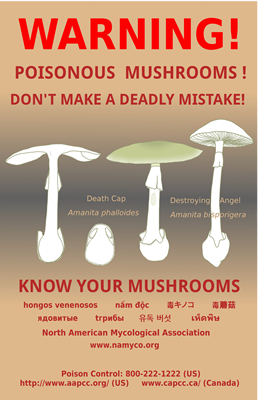 If you suspect that you have consumed a poisonous mushroom, contact a physician, or your local poison control center. Once help has been secured, it is advisable to try to get the suspect mushrooms identified. NAMA provides a list of volunteers who are able to assist with identification in poisoning cases. It is best to get help if you are not familiar with mushroom identification. FILE A REPORT! It is important to file a report, even if the outcome was only a gastrointestinal upset. NAMA tracks ALL mushroom poisonings. After the incident, help document mushroom poisonings by submitting an online report or mail-in report to the NAMA Poison Case Registry. 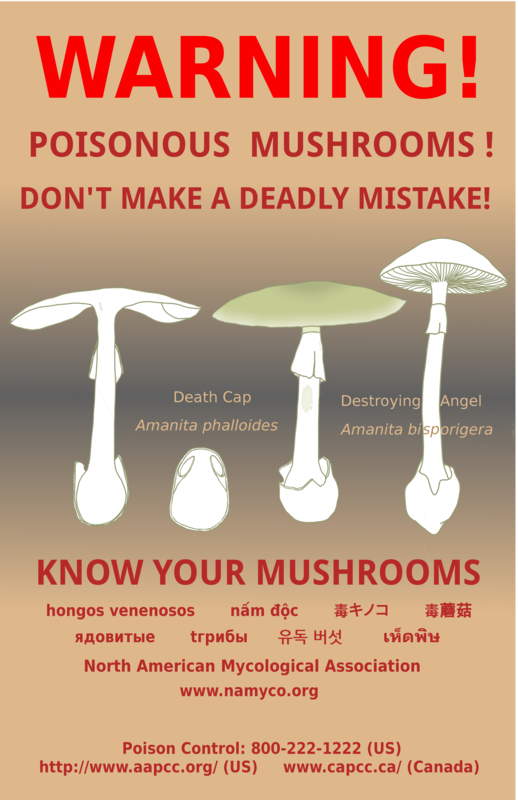 This warning poster notes the two deadly fungi, Amanita phalloides and Amanita bisporigera, responsible for the most fatal poisonings around the world. It includes warnings in several languages. Incidents of mushroom poisoning have been notable in people who are newly arrived in North America. NAMA and cooperating organizations seek widespread distribution of the warning poster. The electronic version (approximately 11" x 17") may be downloaded and printed for educational use. A limited number of posters will be sent without charge when requested for educational, non-commercial use. We would like to thank Martha Gottleib, Chair of the Arts & Graphics Committee, for design and artwork in creating this new version of the NAMA warning poster. Send requests for paper copies of the poster to the NAMA Executive Secretary Barbara Ching by email. We appreciate donations to cover the cost of shipping. Pets have been known to eat mushrooms in yards and on walks. While 99% of mushrooms have little or no toxicity, the 1% that are highly toxic can cause life-threatening problems in pets. Take extra care to keep pets away from areas where mushrooms might be growing. Immediately contact your veterinarian or the NAMA Identifiers list if you see your pet eating a wild mushroom. Try to get a sample of what your pet ate, to assist with identification. More information can be found on our Pet Poisonings webpage. Denis R. Benjamin, Mushrooms: Poisons and Panaceas, W.H. Freeman and Company, New York (1995). Gary Lincoff and D.H. Mitchel, Toxic and Hallucinogenic Mushroom Poisoning: A Handbook for Physicians and Mushroom Hunters, Van Nostrand Reinhold Company, New York, etc. (1977). Joseph F. Ammirati, J.A. Traquair, and P.A. Horgen, Poisonous Mushrooms of Canada, Research Branch Agriculture Canada Monograph 30 (1985). Berger KJ, Guss DA, “Mycotoxins revisited: Part I.” J. Emerg. Med. 2005 Gan; 28(1):53-62. Diaz JH, “Syndromic diagnosis and management of confirmed mushroom poisonings.” Crit Care Med 2005 Feb; 33(2):427-36. Erguven M, Yilmaz O, Deveci M, Aksu N, Dursun F, Pelit M, Cebeci N. “Mushroom poisoning.” Indian J Pediatr 2007 Sep; 74(9):847-52. Escudié L, Fancoz C, Vinel JP, Moucari R, Cournot M, Paradis V, Sauvanet A, Belghiti J, Valla D, Bernuau J, Durand F, “Amanita phalloides poisoning: Reassessment of prognostic factors and indications for emergency liver transplantation.” J Hepatol 2007 March; 46(3) 466-473. Joshi A, Awale P, Shrestha A, Lee M, “Acute Mushroom Poisoning: a report of 41 cases.” JNMA J Nepal Med Assoc 2007 Jan-mar; 46(165):7-12. Karakayali H, Ekici Y, Ozcay F, Bileziki B, Arslan G, Haberal M, “Pediatric liver transplantation for acute liver failure.” Transplant Proc 2007 May; 39(4):1157-60. Madhok M, “Amanita bisporigera. Ingestion and death from mistaken identity.” Minn Med 2007 Sep; 90(9):48-50. Pradhan SC, Girish C, “Hepatoprotective herbal drug, silymarin from experimental pharmacology to clinical medicine.” Indian J Med Res 2006 Nov; 124(5):491-504. Puschner B, Rose HH, Filigenzi MS, “Diagnosis of amanita toxicosis in a dog with acute hepatic necrosis.” J Vet Diagn Invest 2007 May; 19(3):312-7. Rainone F, “Milk thistle.” Am Fam Physician 2005 Oct 1; 72(7):1285-8. Robertson C, Wright L, Gamiet S, Machnicki N, Ammirati J, Birkebak J, Meyer C, and Allen A, “Cortinarius rubellus Cooke from British Columbia, Canada and Western Washington, USA.” Pacific Northwest Fungi 2006 May; 1(6):1-7. Savius P, Danel V, “New Syndromes in Mushroom Poisoning.” Toxicol Rev 2006; 25(3):199-209. Yang WS, Lin CH, Huang JW, Fang CC, “Acute renal failure caused by mushroom poisoning.” J Formos Med Assoc 2006 Mar; 105(3):263-7. Unverir P, Soner BC, Dedeoglu E, Karcioglu O, Boztok K, and Tuncok Y, “Renal and hepatic injury with elevated cardiac enzymes in Amanita phalloides poisoning: a case report.” Hum Exp Toxicol 2007 Sep; 26(9):757-61. Xiao GL, Zhang CH, Liu FY, Chen ZH, Hu SY, “Clinical experience in treatment of Amanita mushroom poisoning with Glossy Ganoderma Decoction and routine western medicines.” Chin J Inter Med 2007 Jun; 13(2):145-147. Zhao J, Cao M, Zhang J, Sun Q, chen Q, Yang ZR, “Pathological effects of the mushroom toxin alpha-amanitin on BALB/c mice.” Peptides 2006 Dec; 27(12):3047-3052.